As you plan for your future you make several important decisions. One of those carefully planned decisions may be to create a lasting impact through a legacy gift. Legacy giving is a meaningful way to make a difference that will endure beyond your lifetime, impacting the lives of generations to come. We invite you to create your legacy today by joining St. Luke’s Wood River Foundation’s Legacy Society. Legacy Society members are those extraordinary individuals who shape the future by including St. Luke’s Wood River Foundation in their estate plans and inspire others to become leaders in legacy giving. 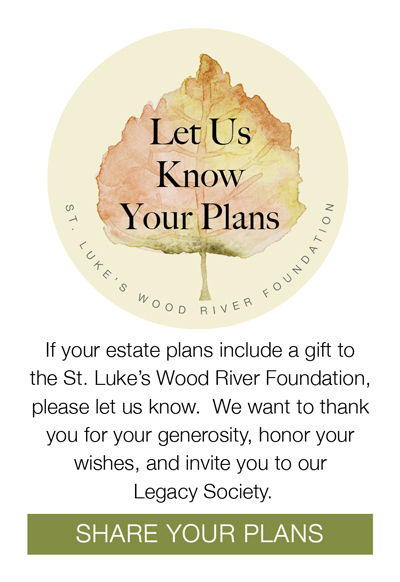 Donors are invited to become a Legacy Society member by informing us that they have made or intend to make, an estate gift that includes St. Luke’s Wood River Foundation. Letting us know your estate planning intentions creates no obligation, but it does help us to assist you in fulfilling your philanthropic goals. If you have included the St. Luke’s Wood River Foundation in your estate plans, please let us know. We would like to honor you, make sure the purpose of your gift is understood, assist you through our Friends of the Hospital program and welcome you to our Legacy Society. We are here to help with your legacy giving questions. Please contact Marsha Edwards at (208) 727-8416 or edwardma@slhs.org for more information. Our Legacy Society members are an exceptional group of individuals committed to ensuring health and healing for generations to come. We are grateful to the following individuals and couples who are shaping the future by sharing their intentions to include St. Luke’s Wood River Foundation in their estate plans. John and Roger DeBard, DeBard Johnson Foundation, Inc.